GOP Congressman: Ban Guns Near Federal Officials : It's All Politics Rep. Peter King said his proposal wouldn't just protect officials but the public as well. 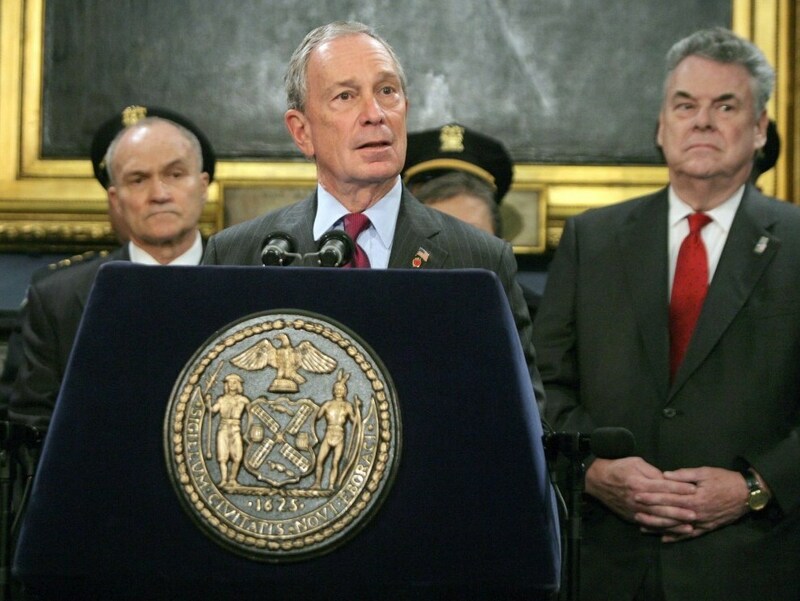 New York City Mayor Mayor Michael Bloomberg talks to the news media as Rep. Peter King (R-NY) stands to the mayor's left. If the House Homeland Security Committee chairman has his way, the carrying of guns by members of the public would be banned within 1,000 feet of federal officials. Rep. Peter King (R-NY) called for the gun-free zone in the immediate vicinity of federal officials on Tuesday at an appearance in New York City. He made his intentions known at a gun-control news conference at New York City Hall with Mayor Michael Bloomberg, a proponent of tougher gun laws, standing by his side. King said he planned to introduce legislation next week incorporating his proposal. While King is generally conservative on most issues, his record on gun-control has been more mixed. It has earned him a grade of D in the past from the National Rifle Association. King's proposal is part of a renewed national debate over tougher gun-control laws in the aftermath of the weekend's shooting in which 20 people were wounded, with six killed. Jared Loughner, 22 and who appeared mentally unstable well before the crime, is the alleged gunman. The congressman framed his idea as not just meant to protect officials but the public as well. "The fact is they do represent the people who elect them, and it's essential if we're going to continue to have contact that the public who are at these meetings are ensured of their own safety," King said. King's legislation has the potential of placing congressional Republicans in a politically difficult position. It would clearly diminish current gun rights in a way the NRA has tended to oppose. And most Republican lawmakers and, depending on their districts, even some Democrats, are loathe to run afoul of the gun-rights lobby. But many lawmakers have been concerned about the safety of themselves and their aides since Saturday's shootings in Tucson and might be more open to King's proposal than they would have been a week ago.